Witold O. Kiezun. Why This Website Was Created? Every year, more and more of the Warsaw Uprising participants are crossing the line of shadow. With their passing go many of their stories that may never be told or remembered. This site attempts to tell some of these stories and preserve them forever. There is also a personal side of this project. Both of my parents were members of the Polish underground Home Army, and took part in the Uprising of 1944. My mother, Danuta Kiezun, 'Jola' ('Yola'), a paramedic in the 'Anna' company of the Gustav-Harnas' battalion, fought in the fiercely defended Old Town quarter. Before the fall of this area, she evacuated through the sewers to City Centre. After surrender, she was sent to various POW camps and, with others, eventually liberated by Gen. Maczek of the Polish First Armored Division from Oberlangen camp on the border of Germany and Holland. 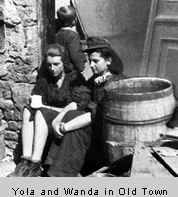 After studying in France, she returned to Poland in 1946. 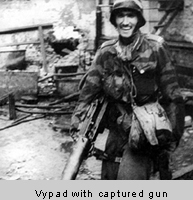 My father, Witold J. Kiezun, 'Wypad' ('Vypad'), was a member of the special operations group during the occupation and fought in the Uprising with 'Harnas' – a special operations platoon of 'Gustav-Harnas' battalion in the Wola and City Centre districts. He participated in the capture of the Central Post Office, Holy Cross Church, and the Police Headquarters. For his bravery, he received a Cross of Valour and an Order of Virtuti Military [ medals ] presented personally by Home Army commander Gen. 'Bor' Komorowski. After surrender, he escaped during transport to a German POW camp. In 1945, he was arrested in Cracow by the Russian secret police [ NKVD ] for being a member of the Home Army, and sent to a gulag in Krasnovodsk, a city located on the eastern shore of the Caspian Sea (now in the Turkmenistan Republic). He miraculously survived captivity and returned to Poland in 1946. 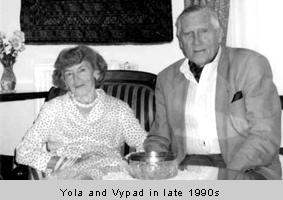 'Jola' and 'Wypad' met each other during the Uprising while stationed in City Centre in the middle of Sept. 1944. It took another five years and thousands of miles of eventful journeys to meet again; this time they stayed together…for life. After living and working in many places around the world during the following 50 years, in 1998 they returned to their beloved Warsaw. I owe them many thanks for their memories and stories of the Uprising and WW II, as well as moral support and providing the documents and resources which made this site possible. This site is dedicated to all those who fought for their freedom in the Warsaw Uprising of 1944 as well as all those who, as civilians, perished in the effort. © Copyright Witold O. Kiezun. All rights reserved.